On First Friday June 3rd, JMichaels Pub at 325 S. Union, hosted an event to introduce the Barn Committee’s invention of the cocktail of the summer. The Goodnight Kiss! The mixologists were Linda Crawford and Cindy Robinson and the photo was taken by L. Savas Razo. 1. 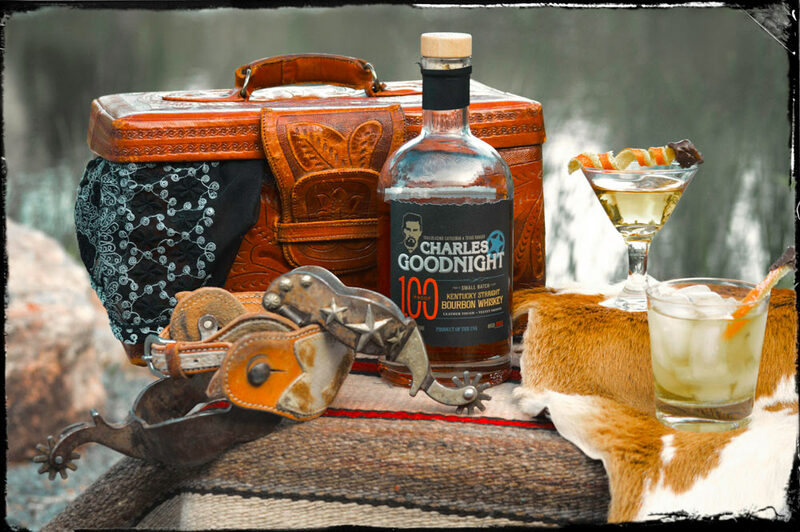 Charles Goodnight Kentucky Straight Bourbon Whiskey, named for the trail blazing cattleman and Texas Ranger. American made small batch bourbon described as “leather tough and velvet smooth.” 100 proof! 2. Domaine de Canton – French ginger Liqueur, Best in Show, Double Gold Medal Liqueur, San Francisco World Spirits Competition. Hand-crafted near Jarnac, France from the finest all-natural ingredients. 3. Regans’ Orange Bitters No. 6 – “The Finest Orange Bitters for Man or Beast,” from the Sazerac Company, New Orleans, Louisiana. Honoring the spirit of the old West and fashioned from the finest ingredients, the sizzling and satisfying Goodnight Kiss will stoke your imagination and fuel your daring! Bite the bullet, garner the courage and have a sip of history…..come get your delightfully fiery Goodnight Kiss!